Cathedral Gap will be one of three entries in the 2018 Prix de West Invitational in Oklahoma City, OK. I have wanted to paint Cathedral Gap for a very long time. This unique and epic scene is located 5 1/2 miles down the Hermit trail from the South Rim at the western end of the Grand Canyon. I know of only one other artist in history who attempted to paint this complicated and challenging view, Louis Akin (1868-1913). Hikers are greeted with The Cathedral Gap vista just above Cathedral Staircase, a very steep portion of the Hermit trail. The Gap is a monumental V-shaped erosion in the towering Redwall limestone that frames a breathtaking view of colossal temples and expansive sky. 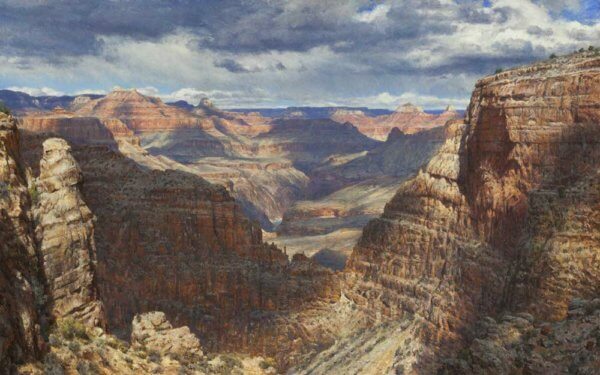 Accented in the center of this grandeur is the Inner Gorge cradling the mighty Colorado River . I chose the afternoon light of summer in which to paint the Gap. By adding a dramatic monsoon sky, I was free to create wind-driven shadow patterns enhancing the drama of Isis, Buda, Zoroaster and Brahma Temples. Painting the weathered, craggy face of the Redwall in mid-ground was a personal inquiry into my skills as an artist.